SocialPilot Review 2019: Best Social Media Scheduling Tool? In this post, we’ll see a detailed review of SocialPilot which is a great tool to schedule all your social media posts and also compare it with industry leaders like Buffer and Hootsuite. SocialPilot is THE social media scheduling tool I use to bulk upload and schedule week's load of social media updates. It's definitely handy when you have to be online on different time zones and share blog posts automatically. In this SocialPilot review, I'll show you how you can save time spent on social media by scheduling and automating social updates. Has all the features you'd need to automate social media. The free plan is a bit limited but that's fairly understandable﻿. It is cheaper than most elite tools out there. Fairly priced for the features it comes with. They don't have video tutorials. No YouTube channel, kinda feels like old school. Update: They now have tutorials on usage. In this Social Pilot review, I'll show you how you can save time spent on social media by scheduling and automating social updates. If you are reading this article, chances are you are worried about the time you have been killing with social media. However, the truth is you also cannot run a business, whether offline or online without proper social media marketing. Here comes the role of social media scheduling tools. Social scheduling apps are dime a dozen in the market, but you have to be very careful in choosing one, that does your work and save you a buck. Today let me introduce you a tool, which has been around for quite a while, and I am just happy trying my hands over it. You too can use it to reduce time spent on social media. SocialPilot – Schedule to over hundreds of apps without shelling hard-earned bucks. Integrate numerous social media accounts on one go. Add branding to your Facebook updates with custom apps. (More on this below). Add multiple feed URL to promote posts automatically when they go published. Create custom groups of connected accounts to post differently based on your audience. Schedule posts for Facebook, Twitter, Googlle+, LinkedIn, Instagram, Tumblr, Pinterest, vk.com and xing amongst the others. Add team members to seamlessly divide your social media tasks. SocialPilot is fully featured social media scheduling and management tool. It is a relatively newcomer as compared to the ones like Buffer or Hootsuite. But has carved a niche for itself with the robust features it provides with little investment. It supports almost every major social media channel including Pinterest, Instagram, Google+ and Tumblr amongst other popular social media channels. If you’re an agency or provide extensive social media marketing services, check out my Sendible vs HootSuite article to know how they can help you better including white-labelled analytics reports. Here are the features of SocialPilot that makes it a winning social media marketing tool. 1) Unified platform for managing large number of accounts. In case you are a social media marketer or a professional digital marketing agency you might have come across the problem of having all the client accounts in one unified master account. SocialPilot saves you the hassle by allowing you to connect as many as 200 social media profiles and up to 500 updates per day. This might not be important for bloggers and single users but is very helpful to manage large number of clientbase. Buffer, it’s closest competitor allows at most 150 profiles but comes with a insanely high price of $400/month. When you have a massive number of updates ready to be scheduled, bulk scheduling is your go to solution. SocialPilot further makes it easy with a visual calendar that helps you visualize which update goes live at what day. This is a great initiative to help bloggers/marketers brand their business on Facebook. Unlike other tools, which display “posted by tool name” , social pilot actually allows you to configure your blog name and show “posted via DigitalGYD.com or your blog name”. The end result will be something like this. Post Instagram, Tumblr posts for sharing on other social media accounts. Automate sharing of YouTube and Vimeo videos to other social media profiles. Here is how to use social pilot app for maximum conversions on social media. On the left bar of the social pilot dashboard, you will find the option to add social accounts. You can add your twitter profile, Facebook and LinkedIn profile, pages, and groups, and your VK account (if you do have one). HOW TO SAVE TIME: There are options to integrate your other social media accounts using Zapier, though. You can thus use social pilot to publish your social update to and from Instagram, Tumblr, WordPress.com etc. This will save a lot of time of yours by automating social updates. You just have to post from the social pilot dashboards and your content will be floating on every social network. Social pilot allows you to create multiple groups to categorize what you publish, like one for news and announcements of your business moves, other can be reserved for Facebook quotes to post and where you do. It is essential to keep a difference on social platforms. You can use groups to post one set of updates to one time zone while other sets of updates to other time zones. HOW TO SAVE TIME: This will help you in saving time by not staying up to update on every time zone. SocialPilot provides you the option to link to blog feeds so that they are shared as soon as they are published. You, however, have the option to send the feed posts in the queue for further customization of timings. This makes a great tool to automatically share blog posts to social media. You can also use it to share your posts as soon as they are published so that they grab maximum eyeballs. You can also use it to add feed URLs of influencers and your blogger friends to share their content and in return make them good friends. HOW TO SAVE TIME: This will help you to concentrate in other things post publishing like, blogger outreach and replying to comments rather than posting to social media. How about scheduling over 500 status updates at one go? Seems impossible? Try SocialPilot to schedule over 500 updates in a .CSV file at a single go. This can be used when you are doing a heavy social media campaign or working on some group projects. SocialPilot offers you to shorten your links so that they are easily shared across the channels look clean and are trackable. It however, has the option to use the raw URL as the shared URL. The other two options include sharing the URL as a goo.gl link or you can connect your bit.ly account to convert those links into bit.ly links. HOW TO SAVE TIME: No need to track each post on each social network, you can directly have an overview as to which link to how much response. Based on this response, you can repost them, change the copy to experiment. Don’t know what to write on social media updates? SocialPilot has an advanced algorithm that curates the best content around the world and suggests you for scheduling them on social media so that you save your time finding content to post. This can also help you to get more visibility and following as you will have more content on social media accounts like Twitter. Both Hootsuite and SocialPilot are amazing and leaders in social media marketing arena and my aim here is not to show someone in the bad light. I use both of them (based on my interest) and though Hootsuite is a much bigger brand with lots of presence, here is where my heart goes..
With the base packages almost similar, SocialPilot allows you to connect up to 100 profiles for $9 while you only get $50 social profiles with Hootsuite. This shouldn’t be a major issue unless you are a social media marketer/ VA like me. The user interface of Hootsuite always kept me away from it. It is too clumsy, while SocialPilot on the other hand is easy to go, clean and minimal. Hootsuite has YouTube integration which SocialPilot adjusts the same using Zapier, similarly Hootsuite lacks native Pinterest integration, which it works out using Tailwind. SocialPilot has a $14 plan with more advanced features but with Hootsuite they have a business plan that has no specific pricing and depends on what you choose. My Verdict: To be honest, the Hootsuite business plan has much more professional and lucrative features like real time analytics, social campaign templates, vanity URL and social media certification. None of these are offered by SocialPilot. SocialPilot is nowhere close to Hootsuite when it comes to professional social media scheduling. Hootsuite is worth every buck you put in there. You might want to check out Sendible vs Hootsuite to see how Hootsuite fairs against another professional social media scheduling tool for agencies. On another note, comparing SocialPilot with Buffer is also interesting. Buffer is way more popular and has maybe hundred times more customers that SocialPilot does. But, you have to remember, SocialPilot is a newcomer and eating the market share of an existing brand is no easy task. It still has managed to garner great reviews. Buffer, in its free plan allows up to 5 social media accounts while it is 3 for SocialPilot. The $9 plan of Buffer allows doesn’t support team collaboration while SocialPilot allows 5 members in the plan. The business plan of buffer starts at $99 up towards $399/month which is way more than most marketers. 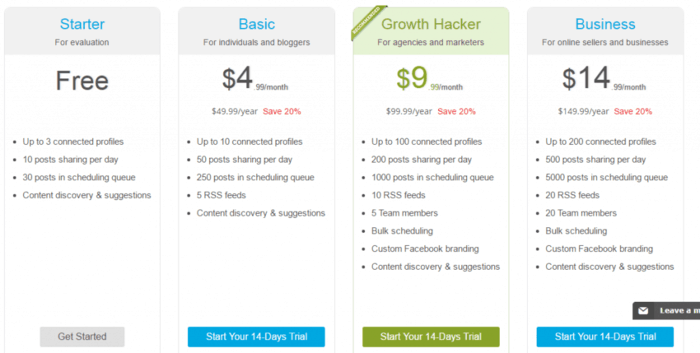 SocialPilot on the other hand has its highest plan below $15 per month. My verdict: Going with Buffer makes sense only if you are a fan of them (they are great and run one of my favorite marketing/research blogs in the world) but if you are serious for business and bucks, going with SocialPilot is a no-brainer. SocialPilot is very affordable and makes social media scheduling within the reach. It has a free plan to get you started and a premium plan that is less than $15 per month, which is quite cheap as compared to its peers. Check the below image for more details on its pricing. SocialPilot rarely provides discount/promo coupons. I contacted Jimit, the head, and he says he has some exciting changes coming over and would also have some awesome discount codes then. Click this link to check if they have discount codes unleashed. Verdict: Should you use social pilot? If you want more branding and a tech team for your support, HootSuite is your go to tool But, if you are looking for a social media scheduling and marketing tool that doesn’t hurt your pocket (and does-it-all kind of tool) SocialPilot is what you should try. It is a very essential tool if used wisely. Therefore, I would recommend SocialPilot to anyone who wants to save time on social media marketing. It makes social media marketing easier and cheaper as compared to its competitors. I would say, no matter how many social media marketing tools you use in your strategies, there is no better conversions than the time you yourself spent on social platforms. If you want to lessen your time spent on social media, focus on two to three social platforms rather than playing every ball. Nobody likes to build relationships with robots, so in addition to using automation, try to build genuine and meaningful relationships on social media. SocialPilot is THE social media scheduling tool I use to bulk upload and schedule week's load of social media updates. It's definitely handy when you have to be online on different time zones and share blog posts automatically. In this Social Pilot review, I'll show you how you can save time spent on social media by scheduling and automating social updates. Social media is considered one of the important aspects when it comes to measure a blog’s popularity of if it comes to drive traffic to the blog. Socialpilot is absolutely a social media scheduling tool which makes it easy for us to manage and schedule posts and social media profiles. SocialPilot is not the only posting service out there. In fact, there are many others that have been around longer than it has. Socialpilot makes it quite easy for me to schedule posts and spread them across even when I’m away. Also, the group functionality makes it easier for us to spread the post on specific networks quickly. We can also select profiles and groups when we are creating/scheduling a post. Eventually, thanks for exploring much additional information regarding this SocialPilot. Now it is hard to imagine a blog without social media support for it. That’s why it is important to have a tool that provides features of using all the social media profiles under one dashboard. The features like scheduling a post, managing multiple accounts and post suggestion is what a website owner looks in such a tool. I am just curious to know if it provides feature of analytics in it. I am using Buffer and Hootsuite free services to schedule my social posts, recently I heard a lot about Social Pilot, scheduling 500 social updates at a time using.CSV file looks amazing, I am planning to go for premium services to schedule my social posts. Is Social Pilot offering any trial or free service to use?, Yes, if they include Pinterest it will help me a lot because I am very active on Pinterest also, thanks for sharing this information about Social Pilot, see you soon with another article. First of all congrats for you new design. This theme looks more neat and clean rather than previous. Now coming to the post, it is very hard to save your time on social media if you are not using any auto pilot. You have shared an awesome tool to save our precious time on letting social media things on auto pilot. Social Pilot surely will help this out. Thanks for this awesome review of Social Pilot. I am gonna try this tool as such tools are indeed required to save a lot of time on social media marketing. Your posts on social media topics are great. Keep them coming! It is a good tool to manage multiple social media accounts and I really like its features like automatic url shortening, bulk scheduling, sharing with images and so on. But it would be really good if it has an option to share our updates on Google Plus. I tried to connect my Pinterest account through Zapier but I was unable to link it. Thanks for writing a good review on SocialPilot and nice to know that you’re also using this dynamic social app.